When was the last time someone put you in the middle of a room, with mirrors all around you, and asked you to stand on a pedestal in front of a lot of people while someone took pictures of you? If you are a model, that is probably just a regular Tuesday morning in your world. For most of us, it is hardly a normal experience. But it is exactly what I did with some bloggers late on a Sunday night at Alfred Angelo's Signature Store in Altamonte Springs. 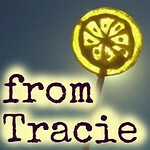 As the first blogger walked out in her dress, I looked around at the rest of us. There was more than one unsure look, and whispered questions about just how much the help is really needed to get into a wedding dress, "because, you know, changing clothes in front of other people...?" Changing into the dress with help wasn't a big issue for me, but did I walk into the store with a list of things that aren't my style. No low cut backs. No strapless dresses. No lace. No fit and flare. I'm really good at identifying all the no's in my life. All the things that won't work. I'm not always so good at identifying the yeses. But as the night progressed, I started to feel a little more brave. I asked our amazing dress expert Jocelyn which dress she would pick for me, and she brought me this dress - Alfred Angelo 896. This was my pedestal moment. A dress I never would have chosen for myself was perfect. It was more than just the dress, though. I had already tried some fantasy ball gowns that were beautiful, but this dress was me. 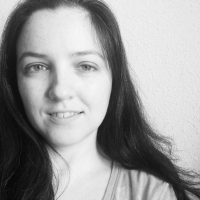 Granted, a much more dressed up version of me than usual, but still me. I know it sounds silly, because this dress is definitely so many of the things I am not - strapless, lacy, fitted. But once it was on me, I saw other things, things that might not mean much to anyone else, but are jumping out at me now even as I look at the picture. The lace is complicated, but the silhouette is simple. It is open and free, yet it fits close. And an understated metallic embroidery makes it shine as if lit from within. All these things feel like small expressions of me. It is a testimony to a beautiful dress, yes, but it is even more of a testimony to a powerful moment. A perfect space in time when we connected on a deep level as women. We let go of fear, dropped our insecurities, and celebrated our beauty and our spirits. We even helped each other with 100's of tiny buttons. And we laughed. So much laughter. This is exactly the kind of experience my friend Lee imagined other women having when she found her perfect dress for the vow renewal she and her husband are planning for their 10th anniversary this summer. 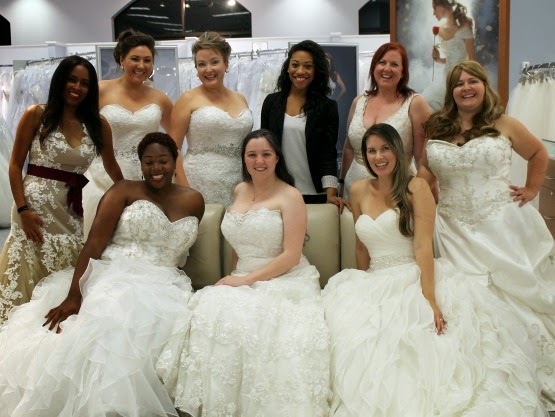 She partnered with Alfred Angelo to develop the Real Women/Real Brides campaign, to encourage women of all body types to step out into the light and make wedding dresses truly beautiful. But even though I've read their stories, and been there when women tried on dresses and were photographed, I didn't imagine how amazing it would be until I was the one standing on that pedestal. I'm not looking to get married again - Thomas and I have already had three weddings together, I don't think we are going for number four - but it was so much fun to try on the dresses. Every bride has a different dress experience. My mom found my wedding dress when she planned an entire wedding for us in three days. It was perfect. I wore it for both our second and third weddings. It will always be the most special dress of my life. I thought about that when my friend Kristi messaged me the day after this event to say, "I saw you wearing my wedding dress on facebook!" That is the power of a wedding dress - over a decade later you can catch just a glimpse of your dress, and you are transported back to that moment when you stood with your true love and made the most special promises of all to each other. A piece of your heart wears that dress forever. Even though these aren't the dresses I was married in, they hold a small piece of my heart, now, too. Because they mark a night when I saw beauty and sisterhood meet. And that is an amazing thing. 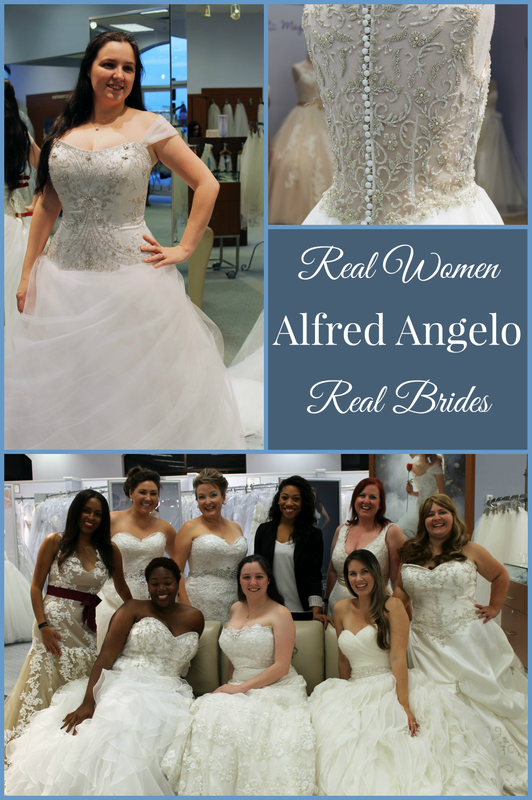 If you want to have an experience like this, you can participate in the Real Women/Real Brides campaign at your local Alfred Angelo. 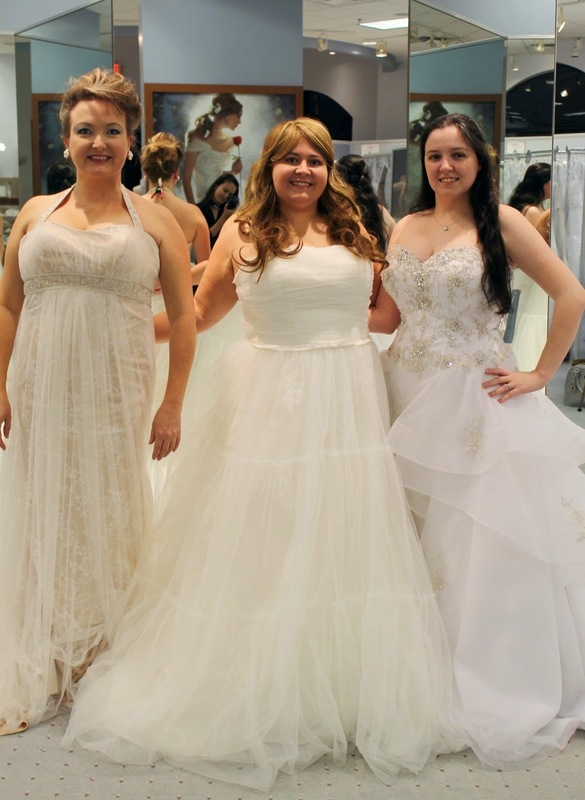 They carry dresses through size 26 (and that is a real size 26, not a wedding dress size 26 that is actually a size 4 in the real world), so there is something for everyone to try. Check out all of the beautiful brides at My Sentiment ExactLee for more information. 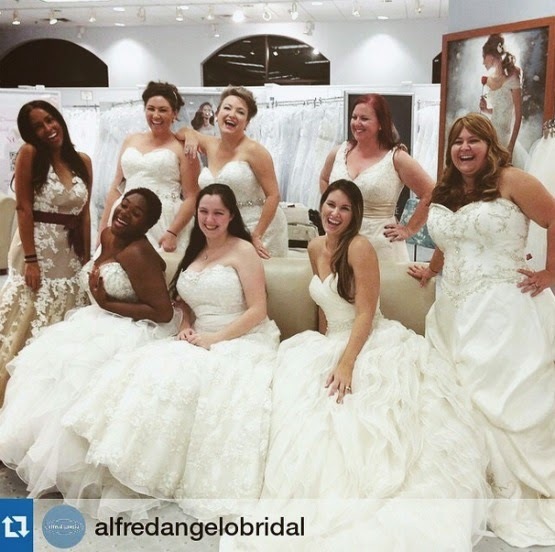 You can also find Alfred Angelo on Instagram and Facebook, because it is always fun to look at incredible wedding dresses, even if you aren't planning a wedding. 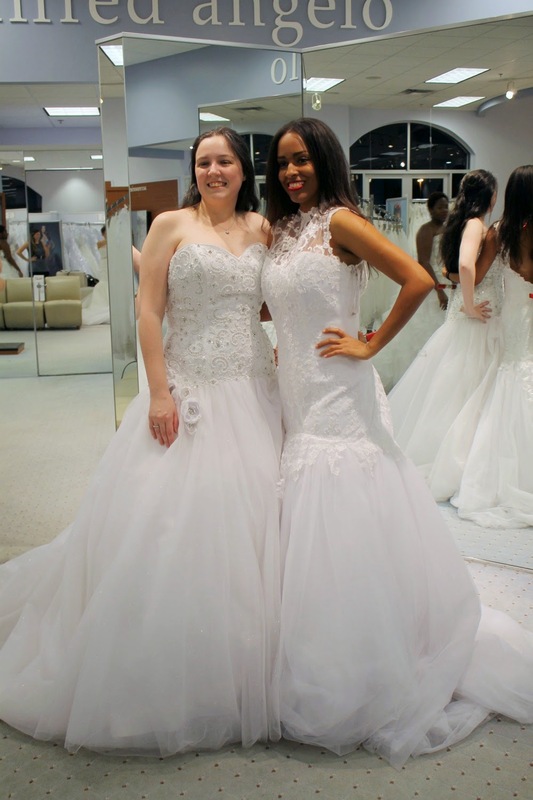 For more wedding dress-trying-on fun, check out this great video from Sparkly Nicole, you will even get to see Kelly helping me put on a dress with hundreds of little buttons. *Disclosure: Alfred Angelo gave me a gift certificate for a bridesmaid dress at this event. I wasn't required to say nice things, or to tell you that I think it would be awesome to wear dress 896 every day. What a fun experience & you look beautiful! All of the ladies look so pretty in the wedding dresses. Looks like you all had a fantastic time! This looks like sooooo much fun! I absolutely love that dress on you! It is so true that sometimes all our no's can cause us to miss a big yes! I think your dress is just gorgeous on you! It's funny how the dress you would never pick out yourself is absolutely perfect! 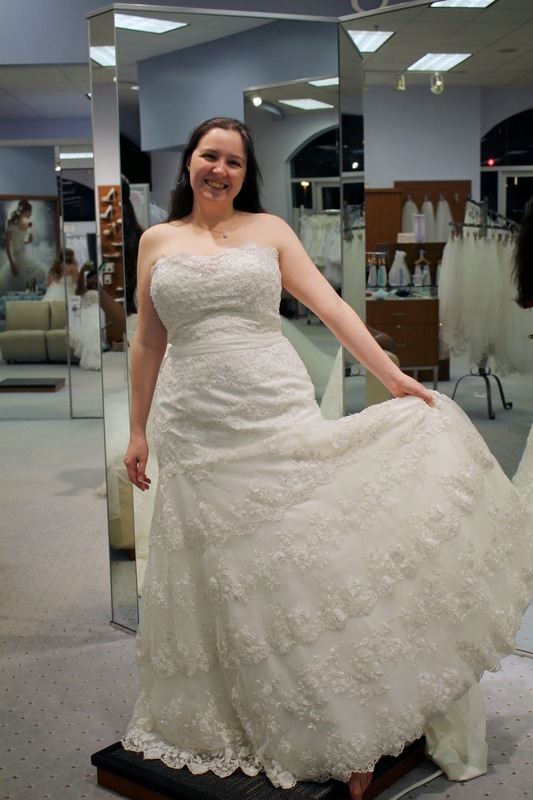 I LOVE trying on Wedding dresses! 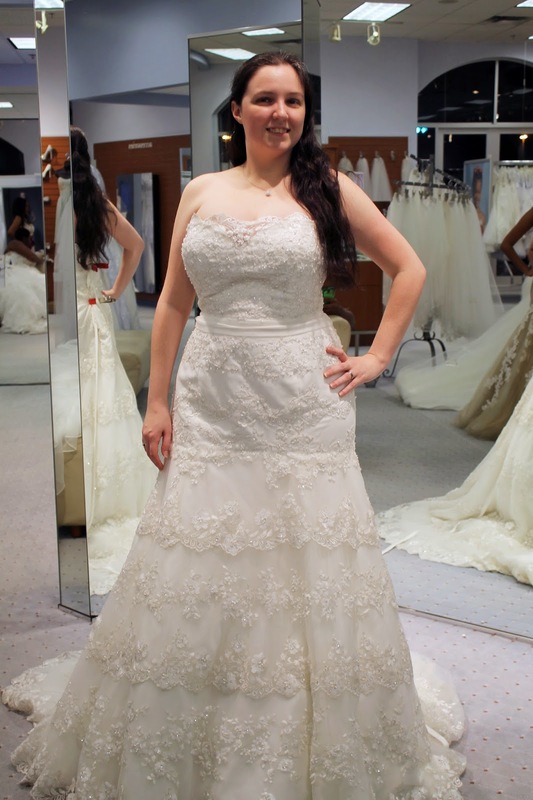 I want to go try some on again, it was a MAGICAL time - dress shopping! These are amazing! I love the lace details on the one that you tried on. I love the group photo. What a great experience. What gorgeous pictures! You look beautiful in that dress, and it seems like it was a really fun and empowering event. Picture perfect. You all look fabulous. wow you look amazing as do all the ladies. What a fun day. You look so awesome! Alfred Angelo is the best. I'm still in awe of my dress every time I see it. You all look so beautiful! What a fun experience! That Alfred Angelo dress is gorgeous on you. Shopping for the dress was one of my favorite parts of wedding planning...and I would totally do it again. You're right, every bride is beautiful in her dress. 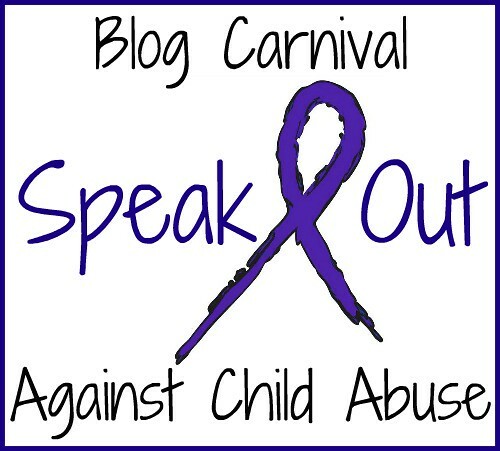 Thanks for sharing the campaign! A wedding dress is a special piece of clothing that has such importantsnce. It is good when the shopping experience is beautiful. It is wonderful when the experience of shopping for the dress is as beautiful as the dress. Oh, this was so fun! I had exactly the same experience when I shopped for gowns—a laundry list of now that were tenderly and astonishingly revealed to be misguided. Imagine what we would do and believe if we allowed for more moments of entertaining that maybe our hard and fast rules are wrong. Wow! What beautiful dresses. It has been 18 years since I bought a dress. This brings back fond memories. What a cool event. Looks like so much fun! You look so happy in that dress! You look fantastic in the dress. And I bet it was a lot of fun to have someone pick something out for you and realize this looks great. You are brave. I got married in shorts and a T-shirt in Cairo Egypt.... I did do the wedding dress when we got back to the States, but that really wasn't me :) Love the dresses you chose. This is such a cool plan! I'm planning on having my own vow renewal for my 10th anniversary! Beautiful! 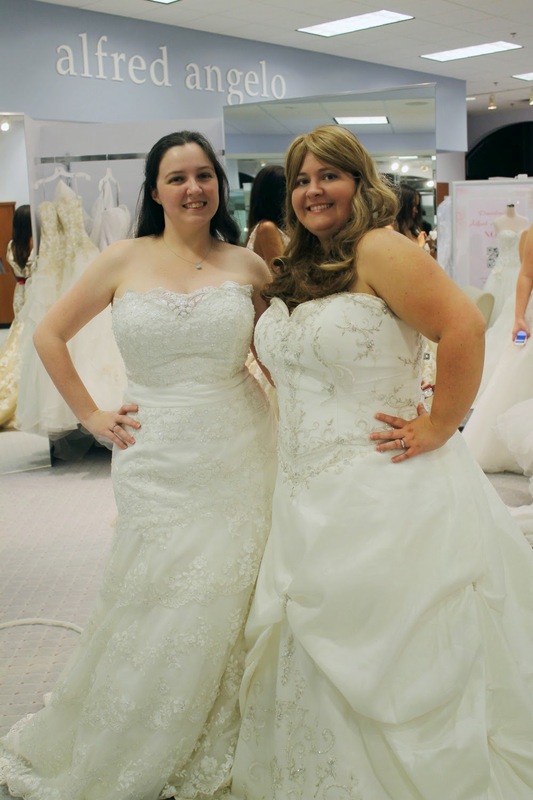 My sister struggles with body image and almost wouldn't buy a wedding dress. In the end, with girlfriends in tow, she had a princess experience and felt so beautiful standing on that pedastal. These dresses are just gorgeous. I love that you were able to see the dress's beauty in spite of the fact it went against what you were thinking you wanted! I saw all these pics on Instagram, so many great bloggers here! I love that dress too. What a gorgeous bride! And yes, that dress is wonderful. Even if it's not you, it is too. It's just radiant. I would love an event like that! You look gorgeous! What a fun and uplifting experience too. You look amazing! Those are some beautiful dresses.